Last month, Raleigh traveled to Austin with some local art in tow! 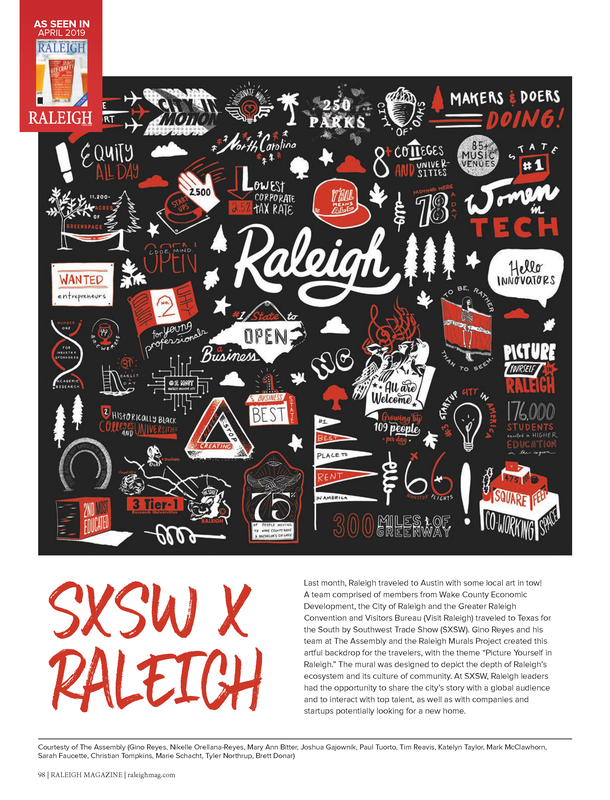 A team comprised of members from Wake County Economic Development, the City of Raleigh and the Greater Raleigh Convention and Visitors Bureau (Visit Raleigh) traveled to Texas for the South by Southwest Trade Show (SXSW). Gino Reyes and his team at The Assembly and the Raleigh Murals Project created this artful backdrop for the travelers, with the theme “Picture Yourself in Raleigh.” The mural was designed to depict the depth of Raleigh’s ecosystem and its culture of community. At SXSW, Raleigh leaders had the opportunity to share the city’s story with a global audience and to interact with top talent, as well as with companies and startups potentially looking for a new home.